Thanks for viewing my listing. Please note that I can ship this item by ParcelForce 48 or pickup can be arranged from London. I accept PayPal. I purchased this many months back in great condition with the wood stock from one of the used airsoft sites. I used a technician to add the aftermarket parts such as the Tophat 3D printed hop up chamber and Tophat High Flow Rocket Valve which make the gun much more enjoyable with added recoil and such. The extended barrel also aids range and makes the gun more accurate. The FPS is dependent on the gas but according to the cheap man’s chrono test, it should be under site limits. This comes with 4 long green gas mags which each hold 29 rounds and cost around £33 for the 3 extra. All 4 of them are gas tight and I have tested them myself, leaving gas in last week and testing them today. I can be convinced to split the mags if anyone would like one or two mags by themselves. The accessories that come with are- the Nikko Sterling Scope, a mostly full tub of gun grease, a bullseye country sport hat, 2000 bulldog BBs, a speedloader, a half full bottle of Abbey Predator gas, suppressor, 4 blocks of beeswax, wood dye, and the 3 extra mags. The upgrades will be listed in the price breakdown. The scope has some minor scratches as shown in the pictures (may not be visible on some sites due to picture limits so ask me if you want to see) and the black small cover on the zeroing dial is missing for the top dial. I do not have the original box but I have an alternate airsoft gun box for shipping. I quit airsoft shortly after the aforementioned upgrades due to studies and kept the rifle on my wall as seen in the pictures but my wall cannot do this justice and thus, I am looking to rehome this beauty. This was never skirmished by me. The wood itself is in excellent condition and in the event the wood is damaged by the new owner, the included wood dye and beeswax can be administered which makes it perfect again. I can provide extra pictures and shooting videos on request if you message me, preferably on the number provided in the pictures. I should have quick replies there and I am available on iMessage, phone calls, or WhatsApp. I would prefer to be messaged on the number as I sometimes do not receive notifications or they take long to arrive on some selling sites. RRP of what is included ASG KC-02- £260 Wood stock-£60 3x extra gas mags-£93 Tophat 3D printed hop up chamber- £27 Tophat High Flow Rocket Valve-£19 Suppressor and extended barrel-£50 Nikko Sterling Scope-£50 Speed loader- £5 Gas-£10 Bulldog BBs-£7 Beeswax and wood dye-£7 Total-£588 66% of RRP-£388.08 Price I am selling for-£275 I believe the price I am selling at is fair, however I am open to reasonable offers. If you have any questions, there is no harm in asking for and I should be able to respond quite quickly. 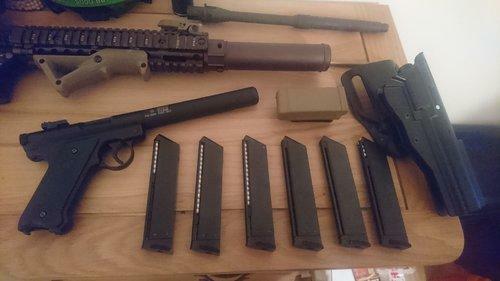 Make: KJW Gun/Model: KP-17 Accessories: Silicone Gun Oil, 2000 BBs, Pistol Stand, original magazine and box Condition: Very good FPS: Up to 350 FPS Price: £140 Swaps: No Please note- Message me on the number in the photo regarding this, I strive to have very quick replies. I can post this item mostly anywhere in the UK and I accept PayPal Goods and Services. Thanks for viewing my listing. This is my KJW KP-17, or rather Glock 17. It is unfair to call this a KJW since it has been nearly completely replaced with: Guarder Frame Guarder Slide Guarder Hammer Bearing Guarder Pistol Lid Guarder Mag Release Guarder Slide Lock Lever Some of these components can be found in the GAR076 Guarder kit which can be found for £149. However, the pistol does not have the entire GAR076 kit but the items above, which are the most important components. I purchased the pistol for around £120, the external components for around £100, and the other accessories for £15 so in total that is around £235. I believe my price of £140 is fair. The added components ensure that the Airsoft pistol looks seriously amazing as it has Glock trademarks and is nearly flawless and kept in perfect condition. The only blemish is represented in the picture, at the top of the slide which can only be hardly seen in normal use and happens naturally with GBBs due to the cycling of the slide. The pistol has never been skirmished but rather kept on my desk for me to look at thus I have included the pistol stand I use on my desk. The pistol also comes with the original magazine, a speedloader, 2000 0.20g BBs, and the original box. I can also provide a can of gas and silicone grease/oil for the pistol for extra. I am selling this as it is going to waste on my desk, and I want it to go to someone else who will love it for all its glamour. I can provide extra pictures and firing videos on request. As I stated at the beginning, if you have any pictures you can text, call, or WhatsApp me on the provided number. I should have quick response times. Please note- The pictures show two guns in identical fashion but one has now been sold so there is only one left, the description has been updated to reflect this. l Goods and Services. Items that come in the package and RRP- We M92 Gen 2 Chrome- £120 Thread adaptors- £9 Suppressors- £10 Pistol display stand- £6 2x black spare mag- £50 (£25 each and come in their own packaging) Pistol Case- £8 Total RRP- £203(not the price I am selling at) 60% of £203= £121.80 Price- £115 More information- Recently bought off of Prefired, but I just sold my rifle, so have no need for any Airsoft guns at the moment. The gun works very well as has been basically unused and is unskirmished. The previous owner was involved with film props so used it for a film I assume and then left it in storage. The WE M92 has a fully automatic mode and has 3 fire selector switch options. As you can see from the pictures the M92 has a suppressor adapter and suppressor which makes it look very nice and resemble the Hitman trademark Silverballer in a way. In total, there are 3 magazines. There are 2 black ones purchased separately which are all gas tight and working well. There is also 1 silver magazine that came with the pistol, which is leaking. I am sure this can be fixed with the provided gun oil, otherwise a simple O ring change. The kick on the pistol is nice and manageable, and it is reasonably accurate. I do not have the original boxes but rather I have a pistol cases which the pistols can be carried in, and also a large cardboard box where the rest of the items can be transported in and is large enough to ship the pistol in if needed. I purchased this pistol with the intent of displaying it and perhaps skirmishing them but as I mentioned earlier, I sold my Airsoft rifle so do not really have a need for such a beautiful display. I have included the clear pistol display which I purchased from Amazon, so if you purchase it you can display it on your desk or elsewhere when not using them. I believe the price is fair for the bundle, but I may be able to negotiate a small bit. I can send more pictures + videos on request. I am very accommodating and have good customer service. My number is 07415097073 so message me on there for very quick responses. In case the number is removed by an ad listing site, it should also be on the first picture. The buyer of the item could also message me for any help or advice relating to the pistols after the sale as customer service is important to me. Please note- The pictures show two guns in identical fashion but one has now been sold so there is only one left, the description has been updated to reflect this. Below is a description and list of parts along with their recommended retail price, as the price I am selling this at is justified. I can post these items mostly anywhere in the UK and I accept PayPal Goods and Services. Items that come in the package and RRP- We M92 Gen 2 Chrome- £120 Thread adaptors- £9 Suppressors- £10 Pistol display stand- £6 2x black spare mag- £50 (£25 each and come in their own packaging) Pistol Case- £8 Total RRP- £203(not the price I am selling at) 60% of £203= £121.80 Price- £115 More information- Recently bought off of Prefired, but I just sold my rifle, so have no need for any Airsoft guns at the moment. The gun works very well as has been basically unused and is unskirmished. The previous owner was involved with film props so used it for a film I assume and then left it in storage. The WE M92 has a fully automatic mode and has 3 fire selector switch options. As you can see from the pictures the M92 has a suppressor adapter and suppressor which makes it look very nice and resemble the Hitman trademark Silverballer in a way. In total, there are 3 magazines. There are 2 black ones purchased separately which are all gas tight and working well. There is also 1 silver magazine that came with the pistol, which is leaking. I am sure this can be fixed with the provided gun oil, otherwise a simple O ring change. The kick on the pistol is nice and manageable, and it is reasonably accurate. I do not have the original boxes but rather I have a pistol cases which the pistols can be carried in, and also a large cardboard box where the rest of the items can be transported in and is large enough to ship the pistol in if needed. I purchased this pistol with the intent of displaying it and perhaps skirmishing them but as I mentioned earlier, I sold my Airsoft rifle so do not really have a need for such a beautiful display. I have included the clear pistol display which I purchased from Amazon, so if you purchase it you can display it on your desk or elsewhere when not using them. I believe the price is fair for the bundle, but I may be able to negotiate a small bit. I can send more pictures + videos on request. I am very accommodating and have good customer service. My number is 07415097073 so message me on there for very quick responses. In case the number is removed by an ad listing site, it should also be on the first picture. The buyer of the item could also message me for any help or advice relating to the pistols after the sale as customer service is important to me. below is a description and list of parts along with their recommended retail price, as the price I am selling this at is justified. I can post this item mostly anywhere in the UK and I accept PayPal Goods and Services. Below is an extensive list of all the items that are coming with this bundle and how much they cost new, the prices are accurate as I have checked them online. After the list, I have provided a long description of all information that can be thought of regarding the rifle. G&G Armament GT Advanced TR4-18 418 wired to Deans (specially built by Jez Armstrong at ProAirsoftSupplies)-£340 BTC Spectre MOSFET MK1 for Gen 2 Gearboxes-£120 SHS High Torque Motor-£35 Lonex 16:1 Gears-£37 SP100 Spring-£11 Ultimate Version 2/3 Anti Reversal Latch-£10 Modify Ceramic Bearing (Imported from Evike America)-£25 Guarder Shims-£5 Lonex Air Seal Nozzle-£5 Lonex Cylinder Head-£12 Airlab Sorbothane Pad-£6 Lonex Piston Head POM-£14 Lonex Red Piston-£18 Lonex Bearing Spring Guide-£16 Prometheus Hard Cylinder-£16 ProWin Hop Up Chamber-£20 Firefly Bucking-£15 Prometheus Flat Nub (Hard)-£13 Prometheus Tight Bore Barrel-£45 FMA 35x198mm Noveske Firepig-£20 Mad Bull Noveske NSR-13.5 keymod rail-£130 PTS Ergo magwell grip-£14 Strike Systems 416 retractable stock-£15 PTS quick release & wide trigger guard-£5 Ares Hand Stop Set Type C-£12 G&G Hi Cap x2(one came with the rifle)-£23 ACOG Style Scope with 4x magnification-£32 VP Racing 7.4V 1300mAH lipo wired to Deans-£11 Killflash for scope-£5 Nuprol N Mag-£11 3300 0.25G Razr BBs unopened-£10 One-point sling-£6 QD Mount-£3 Carrying bag (the gun will come in this, packaged, large bag with space for many things)- £21 Fast Mag Pull-£2 Barrel extender-£8 Total-£1075 not including labour which would easily be hundreds of pounds. Most internal upgrades were done by Fire support. 60% of £1075 = £645 I am willing to let this go for £500. I am selling as I want someone to use and love the rifle. I can provide proof of purchase for upgrades if wanted. I originally priced this at £620 but this is a realistic price and I can negotiate a small bit. I can send more pictures + videos on request. I am very accommodating and have good customer service, also I can two-tone if needed. My number is 07415097073 so message me on there for very quick responses. The buyer of the item could also message me for any help or advice relating to the rifle after the sale as customer service is important to me. Apologies for all the text, but I want to ensure all the details are here. Collection from London may be available. Here is the pride and joy of my wall, the G&G Top Tech TR4-18 with fully working Pneumatic Blowback that adds to the realism of the rifle without wasting battery or parts. This gun was bought from ProAirsoft Supplies. Jez Armstrong from ProAirsoft Supplies built this and added some of the external modifications, including a BD Troy Battle Ax type stock which I did not like so I replaced with the Strike Systems HK416 stock which looks the part. Now regarding the performance of the rifle, it shoots well and accurate with 0.25G BBs, which are included. These BBs are very high quality, and BBs around this weight range are recommended for any AEG. This rifle comes with everything you need to start firing immediately including BBs, battery, scope, and mags. In total there are 2 G&G Hi Cap mags and 1 Nuprol N mag Midcap, which has some tape on the upper in order to ensure a snug fit into the magwell. The rifle also comes with an ACOG style scope, which is 4x magnified and I also have a killflash, which needs to be sellotaped on if you want protection. The ACOG has been zeroed in very nicely, and it flies true to sight. The sight adds a nice military look to the rifle and definitely looks the part. I bought the upgrades and rifle to make it better for skirmishing in the future, but will not get many chances to go skirmishing, so that is why I want someone more deserving to get this beauty, and for a great price. This gun works 100%. In total, the rifle cost over £1300 including labour fees, and a detailed list can be found above. The rifle comes with a QD sling mount and a one-point sling, so you can easily carry this, it has not been skirmished and rather kept in storage or my wall as you can see in the picture, but it is simply a waste of a great Airsoft rifle. It also comes with handstops, which are a grip variant, one of which is already on the gun and the other is in packaging as I have no use for it. To attach it, all you need is a Torx Screwdriver(which I can provide if need be). The only blemishes on the entire gun is a little dirt or something on the silencer within the rifle, which is hard to spot anyway, and I am sure can be cleaned. I have also bought a silencer adaptor which functions so the suppressor on the gun can be extended to normal length outside the barrel, which, as seen in the pictures, does its job. Due to the keymod handrail and upgraded barrel, this rifle does not have the ordinary threads, but a much nicer looking, bespoke inner thread that is extended by the adaptor. I have put a lot of effort into assembling the costs above in order for the buyer to know exactly what they are getting and the recommended retail price of it. You may have read negative things online regarding the TR4-18 but the issues are completely alleviated in my rifle, as most of it has been replaced. Any potential magazine well issues have been rectified in this version, the Gen 3, and the faulty stock MOSFET has been replaced. If you need confirmation I am sure Jez Armstrong on Facebook would be more than accommodating, as he has been to me. Have any questions? message me on my number at the bottom and I should reply speedily. A little titbit about the BTC Spectre MOSFET is it is one of the most revolutionary in Airsoft, and many guides can be found online, this is the MK1 version without the Bluetooth, and for GEN 2 gearboxes. Has many features such as battery warning, active braking, Precocking, ROF controls, fire selector controls, and more. I currently have the full auto ROF set with a 70ms delay. This MOSFET allows you to use 11.1V lipo batteries if you want, the gun comes with a 7.4v Lipo regardless. The FPS of this is up to 350 FPS which is allowed at all UK sites AFAIK as they permit either 350FPS or 328 +- 5% which is 348 or so FPS for Full Auto guns, and of course with the MOSFET you could lock the rifle to semi for DMR use. Here is the pride and joy of my wall, the G&G Top Tech TR4-18 with fully working Pneumatic Blowback that adds to the realism of the rifle without wasting battery or parts. This gun was bought from ProAirsoft Supplies, specifically regarding this post https://bit.ly/2KYyuyF . Jez Armstrong from ProAirsoft built this and added some of the external modifications, including a BD Troy Battle Ax type stock which I did not like so I replaced with the Strike Systems HK stock which looks the part. Now regarding the performance of the rifle, it shoots well and accurate with 0.25G BBs, which are included, but of course will fly straighter with higher weight BBs. This rifle comes with everything you need to start firing immediately including BBs, battery, charger, scope, and mags.In total there is 2 G&G Hi Cap mags and 1 Nuprol N mag Midcap, which has some tape on it in order to ensure a snug fit into the magwell. The rifle also comes with a short dot scope which is a nice investment as it goes from 1.5x magnification to 5x. I also purchased a killflash for the scope, but I am not sure if you can screw it into the scope, so on a game day, you may need to dash a bit of sellotape and affix it and then take it off after the game so the covers can close. If you want to purchase the rifle without the scope that is possible as I can still return it, as I only recently started outfitting the rifle to make it better for skirmishing in the future, but will not get many chances to go skirmishing, so that is why I want someone more deserving to get this beauty, and for a great price. This gun works 100%. In total, the rifle cost over £1300 including labour fees, and a detailed list can be found below, in case you were wondering where more info can be found. The rifle comes with a QD sling mount and a one point sling so you can easily carry this, it has not been skirmished and rather kept in storage or my wall as you can see, as it looks amazing on the wall but is a waste. It also comes with handstops, one of which is already on the gun and the other is in packaging as I have no use for it. To attach it, all you need is a Torx Screwdriver. The only blemishes on the entire gun is a little dirt or something on the silencer within the rifle, which is hard to spot anyway and I am sure can be cleaned. I have also ordered a silencer adaptor from China which has not come yet so the suppressor on the gun can be extended to normal length outside the barrel, which has not come yet, and if the item is sold before it comes, I will ship it to you when it comes. I have put a lot of effort into assembling the costs down below in order for the buyer to know exactly what they are getting, and to prevent a buyer having to make a PayPal Dispute, as I know what that is like. You may have read bad things online regarding the TR4-18 but the issues are completely alleviated in my rifle, as most of it has been replaced. Any potential magazine well issues have been rectified in this version, the Gen 3, and the faulty stock MOSFET has been replaced. If you need confirmation I am sure Jez Armstrong on Facebook would be more than accomodating, as he has been to me. Have any questions, message me on my number at the bottom. A little tidbit about the BTC Spectre MOSFET is it is one of the most revolutionary in Airsoft, and many guides can be found online, this is the MK1 version without the Bluetooth, and for GEN 2 gearboxes. Has many features such as battery warning, active braking, Precocking, ROF controls, fire selector controls, and more. This allows you to use 11.1V lipo batteries if you want, I also have a voltage checker to ensure that the batteries are charged. The FPS of this is up to 350 FPS which is allowed at all UK sites AFAIK as they permit either 350FPS or 328 +- 5% which is 348 or so FPS for Full Auto guns, and of course with the MOSFET you could lock the rifle to semi for DMR use. Below is an extensive list of all the items that are coming with this bundle and how much they cost new, the prices are accurate as I have checked them online. Rifle- G&G Armament GT Advanced TR4-18 418 wired to Deans(specially built by Jez Armstrong at ProAirsoftSupplies)-£340 BTC Spectre-£120 SHS High Torque Motor-£35 Lonex 16:1 Gears-£37 SP100 Spring-£11 Ultimate Version 2/3 Anti Reversal Latch-£10 Modify Ceramic Bearing(Imported from Evike America)-£25 Guarder Shims-£5 Lonex Air Seal Nozzle-£5 Lonex Cylinder Head-£12 Airlab Sorbothane Pad-£6 Lonex Piston Head POM-£14 Lonex Red Piston-£18 Lonex Bearing Spring Guide-£16 Prometheus Hard Cylinder-£16 ProWin Hop Up Chamber-£20 Firefly Bucking-£15 Prometheus Flat Nub (Hard)-£13 Prometheus Tight Bore Barrel-£45 FMA 35x198mm Noveske Firepig-£20 Mad Bull Noveske NSR-13.5 keymod rail-£130 PTS Ergo magwell grip-£14 Strike Systems 416 retractable stock-£15 PTS quick release & wide trigger guard-£5 Ares Hand Stop Set Type C-£12 G&G Hi Cap x2-£23 1.5-5x40 short dot scope(Comes with extra scope mounts)-£51 VP Racing 7.4V 1300mAH lipo wired to Deans-£11 Killflash for scope-£5 Nuprol N Mag(tape around the upper half to ensure the mag does not wobble in the magwell)-£11 3300 0.25G Razr BBs unopened-£10 One point sling-£6 QD Mount-£3 Carrying bag- £21 Turnigy Balance Charger-£12 12V DC 2A Power supply-£6 Voltage Checker-£1 Fast Mag Pull(Not pictured)-£2 Total-£1104 not including labour which would easily be hundreds of pounds. Most internal upgrades were done by Fire support. 60% of £1104 = £662.40 Price-£662.40 Postage(by ParcelForce 48)-£25 Paypal Fees-£18 Total selling price-£705.40 I am willing to let this go for £550 posted all in as I want someone to use and love the rifle. I can provide proof of purchase for upgrades if wanted. I originally prices this at £620 but this is a realistic price and I will want the very nearest offer. Remember that I will lose almost £50 to PayPal fees and postage. I can send more pictures + videos on request, I am very accomodating and have good customer service, also can two tone if needed. The buyer of the item could also message me for any help or advice relating to the rifle after the style. Apologies for all the text, but I want to ensure all the details are here. Collection from Wimbledon, London may be available. This is my .357 revolver that I recently purchase. It is unblemished and comes with the original box as well with the extra shells and C02 cartridges I purchased for it. This revolver is quite sturdy, all metal, and the kick is decent, it is operational in single and double action and is fun to shoot, as it has cartridges, it is more of a novelty item especially with the cool cartridges and speedloader. What comes with- -KWC Colt Python 4" Revolver in Black -11 shells with space for 1 Airsoft 6MM Pellet and original packaging for the shells -Speedloader -6 Inert .357 shells I use for display purposes as they look cool -9 C02 cartridges -Original box and allen key Can throw in a few BBs as well. I can also post this item easily, collection is also available from London. FPS is unknown at this time. Here is the pride and joy of my wall, the G&G Top Tech TR4-18 with fully working Pneumatic Blowback that adds to the realism of the rifle without wasting battery or parts. This gun was bought from ProAirsoft Supplies, specifically regarding this post https://bit.ly/2KYyuyF . Jez Armstrong from ProAirsoft built this and added some of the external modifications, including a BD Troy Battle Ax type stock which I did not like so I replaced with the Strike Systems HK stock which looks the part. Now regarding the performance of the rifle, it shoots well and accurate with 0.25G BBs, which are included, but of course will fly straighter with higher weight BBs. This rifle comes with everything you need to start firing immediately including BBs, battery, charger, scope, and mags.In total there is 2 G&G Hi Cap mags and 1 Nuprol N mag Midcap, which has some tape on it in order to ensure a snug fit into the magwell. The rifle also comes with a short dot scope which is a nice investment as it goes from 1.5x magnification to 5x. I also purchased a killflash for the scope, but I am not sure if you can screw it into the scope, so on a game day, you may need to dash a bit of sellotape and affix it and then take it off after the game so the covers can close. If you want to purchase the rifle without the scope that is possible as I can still return it, as I only recently started outfitting the rifle to make it better for skirmishing in the future, but will not get many chances to go skirmishing, so that is why I want someone more deserving to get this beauty, and for a great price. This gun works 100%. In total, the rifle cost over £1300 including labour fees, and a detailed list can be found below, in case you were wondering where more info can be found. The rifle comes with a QD sling mount and a one point sling so you can easily carry this, it has not been skirmished and rather kept in storage or my wall as you can see, as it looks amazing on the wall but is a waste. It also comes with handstops, one of which is already on the gun and the other is in packaging as I have no use for it. To attach it, all you need is a Torx Screwdriver. The only blemishes on the entire gun is a little dirt or something on the silencer within the rifle, which is hard to spot anyway and I am sure can be cleaned. I have also ordered a silencer adaptor from China which has not come yet so the suppressor on the gun can be extended to normal length outside the barrel, which has not come yet, and if the item is sold before it comes, I will ship it to you when it comes. I have put a lot of effort into assembling the costs down below in order for the buyer to know exactly what they are getting, and to prevent a buyer having to make a PayPal Dispute, as I know what that is like. You may have read bad things online regarding the TR4-18 but the issues are completely alleviated in my rifle, as most of it has been replaced. Any potential magazine well issues have been rectified in this version, the Gen 3, and the faulty stock MOSFET has been replaced. If you need confirmation I am sure Jez Armstrong on Facebook would be more than accomodating, as he has been to me. Have any questions, message me on my number at the bottom. A little tidbit about the BTC Spectre MOSFET is it is one of the most revolutionary in Airsoft, and many guides can be found online, this is the MK1 version without the Bluetooth, and for GEN 2 gearboxes. Has many features such as battery warning, active braking, Precocking, ROF controls, fire selector controls, and more. This allows you to use 11.1V lipo batteries if you want, I also have a voltage checker to ensure that the batteries are charged. The FPS of this is up to 350 FPS which is allowed at all UK sites AFAIK as they permit either 350FPS or 328 +- 5% which is 348 or so FPS for Full Auto guns, and of course with the MOSFET you could lock the rifle to semi for DMR use. Below is an extensive list of all the items that are coming with this bundle and how much they cost new, the prices are accurate as I have checked them online. Rifle- G&G Armament GT Advanced TR4-18 418 wired to Deans(specially built by Jez Armstrong at ProAirsoftSupplies)-£340 BTC Spectre-£120 SHS High Torque Motor-£35 Lonex 16:1 Gears-£37 SP100 Spring-£11 Ultimate Version 2/3 Anti Reversal Latch-£10 Modify Ceramic Bearing-£25 Guarder Shims-£5 Lonex Air Seal Nozzle-£5 Lonex Cylinder Head-£12 Airlab Sorbothane Pad-£6 Lonex Piston Head POM-£14 Lonex Red Piston-£18 Lonex Bearing Spring Guide-£16 Prometheus Hard Cylinder-£16 ProWin Hop Up Chamber-£20 Firefly Bucking-£15 Prometheus Flat Nub (Hard)-£13 Prometheus Tight Bore Barrel-£45 FMA 35x198mm Noveske Firepig-£20 Mad Bull Noveske NSR-13.5 keymod rail-£130 PTS Ergo magwell grip-£14 Strike Systems 416 retractable stock-£15 PTS quick release & wide trigger guard-£5 Ares Hand Stop Set Type C-£12 G&G Hi Cap x2-£23 1.5-5x40 short dot scope(Comes with extra scope mounts)-£51 VP Racing 7.4V 1300mAH lipo wired to Deans-£11 Killflash for scope-£5 Nuprol N Mag(tape around the upper half to ensure the mag does not wobble in the magwell)-£11 3300 0.25 Razr BBs unopened-£10 One point sling-£6 QD Mount-£3 Carrying bag- £21 Turnigy Balance Charger-£12 12V DC 2A Power supply-£6 Voltage Checker-£1 Total-£1102 not including labour which would easily be hundreds of pounds. Most internal upgrades were done by Fire support. 60% of £1102 = £661.20 Price-£661.20 Postage(by ParcelForce 48)-£25 Paypal Fees-£18 Total selling price-£704.20 But, I said bargain in the title, so I am willing to let this go for £620 posted all in. Remember that I will lose almost £50 to PayPal fees and postage. Depending on circumstances I am willing to negotiate, but you can clearly see the bargain I am giving message me on 07415097073 for near instant responses. I can send more pictures + videos on request, I am very accomodating and have good customer service, also can two tone if needed. The buyer of the item could also message me for any help or advice relating to the rifle after the style. Apologies for all the text, but I want to ensure all the details are here. Collection from Wimbledon, London may be available. Hi, here is my WE T-Rex Hi Capa in full working order. I bought this gun one or two years ago but it has never been skirmished, just been displayed with the shown display stand that is included. I am selling this as I purchased an assault rifle. I can post this for a surcharge of 5 Pounds. I am including a lot of accessories with this that are detailed here:-Speedloader-Around 500+ 0.4BBs, these are 95% Longbow BBs and 5% Razr BBs that I had from my sniper. They come in a little plastic bag as I do not have the original bottles, they are unblemished and unused and very good quality.-Belt with mag pouches and holster, just type up tactical belt on eBay-ASG pistol display stand-Two mags, one purchased two weeks ago, full sealed and no leaks-3/5 full can of WE Green GasI will respond here as fast as I can, but I prefer to be messaged on 07415097073 as I can respond instantly, as I am a very prompt person. Any questions please message me. Price can be discussed, but I firmly believe, especially with the high quality BBs this is more than worth it. Hi, here is my WE T-Rex Hi Capa in full working order. I bought this gun one or two years ago but it has never been skirmished, just been displayed with the shown display stand that is included. I am selling this I am including a lot of accessories with this that are detailed here: -Speedloader -Around 500+ 0.4BBs, these are 95% Longbow BBs and 5% Razr BBs that I had from my sniper. They come in a little plastic bag as I do not have the original bottles, they are unblemished and unused and very good quality. -Holster from a belt -ASG pistol display stand -Two mags, one purchased two weeks ago, full sealed and no leaks -3/5 full can of WE Green Gas I am also selling a green carrying case that can be purchased as well, but is not including, that and a few more pics are located in this imgur link https://imgur.com/a/nDxIrao Any questions please message me. Price can be discussed, but I firmly believe, especially with the high quality BBs this is more than worth it. You lowered the price to £150 on zero in with postage included but you lost it as £175 here. As the title says, I would like a WW2 airsoft rifle, preferably one with real wood that looks amazing, planning on wallhanging it in my room, so does not specifically need to be working but would like it to be. Message me on 07415097073 if you have one available, or just post pics of yours for me to gawp over, your wish.